How can you not fall in love with Douglas!? A gorgeous, bewildered young bear searching for a hug. This book is warm, funny and clever and the kids will love it! Sleepy young Douglas wakes up in need of a hug. He carefully wriggles out of his pyjamas, brushes his hair and goes searching for one – in all the wrong places. He hugs a rock. He hugs a tree. He hugs a bush, then the herd of sheep that were hiding in it! He climbs up a tree, then digs down in a rabbit hole… but none of them are right and poor Douglas just can’t seem to find the hug he’s looking for. Douglas is so perfectly childlike with his serious search, earnest attempts and perseverance. David Melling captures his character so beautifully with his simple yet communicative expressions. You just have to smile as Douglas stumbles around searching for the hug he knows he needs but can’t quite remember where to find. Little ones will giggle along with Douglas’s antics as he tries to cuddle armfuls of wriggly sheep, knocks an owl out of its tree and wipes his nose on a poor rabbit’s behind! 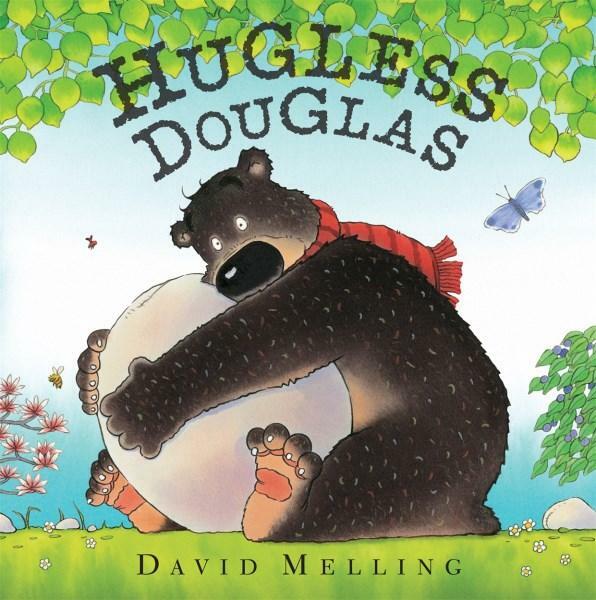 And of course, they will be left feeling all warm and fuzzy when Douglas finally finds the hug he’s been looking for…. The book also contains plenty of subtle learning opportunities for pre-schoolers with Douglas looking for hugs that are big, then tall, then comfy, and descriptions are supported well by the images. The layout is fantastic with the words becoming part of the illustrations through clever use of fonts and positioning. This really engages kids in the words as the varying fonts and sizes make the words part of the visual story. This is a gorgeous picture book with just the right blend of warmth and humour that will appeal to kids of all ages.